River Valley senior George Rickett runs in the final leg of the 4x800m relay at the TVC Ohio championships on May 2 in The Plains, Ohio. ROCKSPRINGS, Ohio — A great start to the postseason. On Tuesday, the opening day of the Division II Southeast District at Meigs High School, a total of eight local athletes, seven Raiders and one Blue Devil, finished top-4 and punched a ticket the Region 7 championships. With four events scored, Sheridan leads the boys competition with a team total of 26, followed by Jackson at 18 and Warren at 17. River Valley is tied with Fairfield Union for fourth, with both squads at 14. Gallia Academy sets in seventh with a score of 12, while Meigs is tied with Vinton County for 13th at three points apiece. 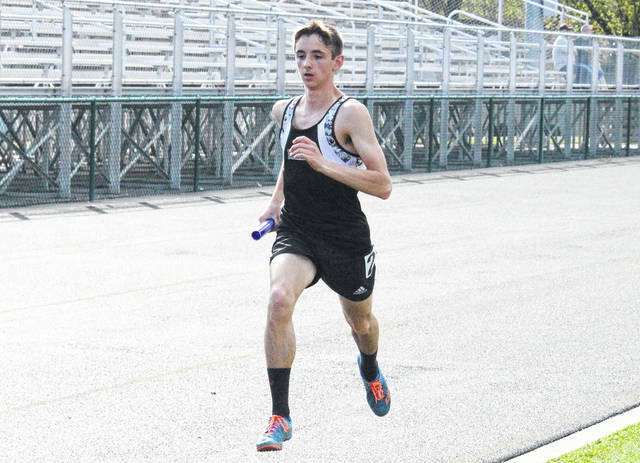 The RVHS boys’ 4x800m relay team of Kyle Coen, Brandon Call, Nathaniel Abbott and George Rickett will be headed to the regional meet after a fourth place time of 8:40.05. Individually for the Raiders, Eric Weber claimed second in the discus throw with a distance of 136-00. The lone Blue Devil to advance from the first day of competition was junior Cory Call, who turned in a third place long jump leap of 19-11¼. While Meigs didn’t have an athlete advance from the first day, Matthew Jackson led MHS with a sixth place throw of 122-5 in the discus. With three events scored, Fairfield Union leads the girls team standings with 21, a single point ahead of second place Warren and two in front of third place Fairland. The Lady Raiders are currently fifth with 11, the Blue Angels are eighth with 4.5, while Meigs is in 11th with a total of three. Advancing to the regional meet for River Valley are Madison Tabor and Kelsey Brown, who were third and fourth in the shot put with distances of 33-10½ and 33-4½ respectively. The GAHS girls’ best finish of the day was sixth place by the relay team Kristen Jamora, Brooke Johnson, Brooke Hamilton and Sarah Watts, who turned in a tome of 10:48.78 in the 4x800m. The Lady Marauders best finish of the day was a sixth place mark of 32-5¼ by Caroline Roush in the shot put. The final day of the district meet will be on Saturday at MHS. Visit www.baumspage.com for complete results of the 2018 Division II Southeast District meet.